This section provides a quick description of how constructor's prototype objects form a two-level inheritance. A tutorial example is provided to show object property inheritance from first and send level prototype objects. Now we know how an object inherits properties from its constructor's prototype object. Since the constructor's prototype object can also inherit properties from its own constructor's prototype object, an object can inherit properties from its own prototype object and the prototype's prototype object. 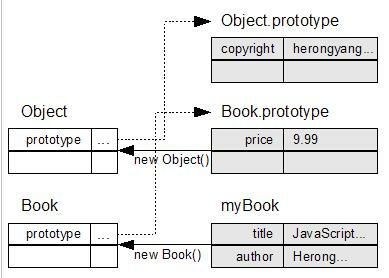 // Define the constructor: "Book"
// Adding a property to the "prototype"
// Adding a property to the prototype's "prototype"
// Creating an object: "myBook"
The diagram below shows you how properties from prototype objects of two levels are inherited by the object.